EAST CANTON, Ohio — Sometimes a little hands-on experience is all it takes to develop a passion for a career — and other times — the experience causes a person to consider a different career altogether. 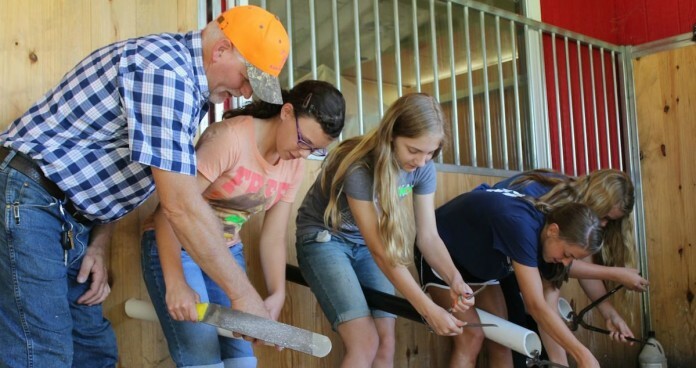 Both things happened the past couple days at Red Star Veterinary Clinic, where more than 100 middle and high school students gathered for the second annual veterinary camp. Some went home with even more passion to become a veterinarian, and some decided on a different career — but still related to animals. 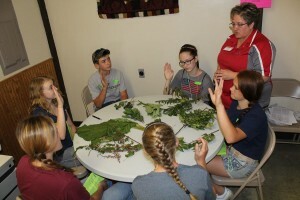 The goal of the program, said Veterinarian Trish Pugh, was to “show the different career opportunities available, related to agriculture or animals,” and to “open up the diversity” for students to see. Pugh and her veterinarian staff, plus several volunteers, walked students through more than a dozen workshop sessions — each focussed on a specific part of animal care or nutrition. They learned about such things as X-rays, dental health, how to check the heart and internal organs, how to handle injured or sick animals, and how to trim and shoe a horse’s feet. Veterinarian Michelle Hall, who works out of the same office, said the event provided a good way to reach out to students with an animal-career interest, at a time when many are considering which college they want to attend, and what they want to become. Eighth graders Shelby Lewis and Cassidy Kiko, of the Louisville school district, and Sydney Lavelle, of North Canton, said they came with a strong veterinary interest, and had their interest reconfirmed. They each have horses and said it was “cool” to see and try the many different things veterinarians do. In the afternoon, the group got to try one of the more graphic things veterinarians do — an operation. With The Birdie Song playing in the background, they put on surgery gloves, hats, aprons and face masks, and dissected whole chickens. 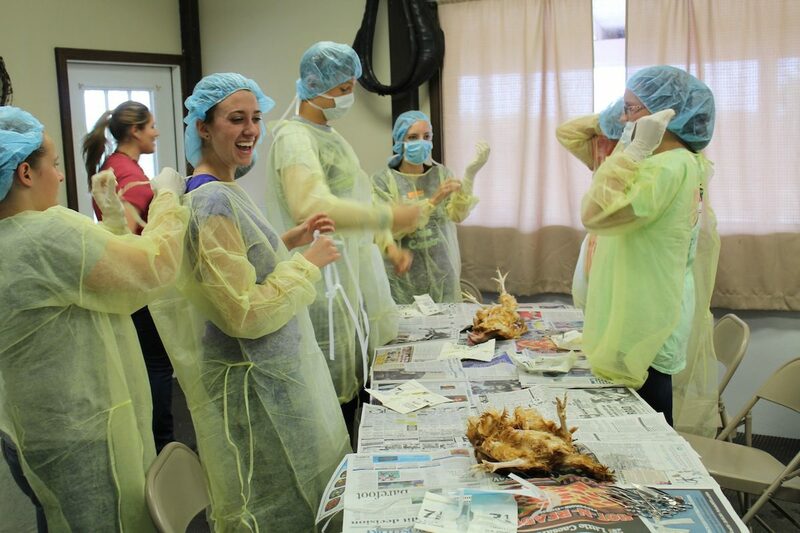 Instructors from the clinic led the dissection, explaining each part of the bird and its function. At the end, students were permitted to dissect additional parts. “Poke, stab, cut whatever you want to check out,” said Matt Kidd, a volunteer with WMI Veterinary Supply. Kidd said dissections and operations are a simple fact of being a veterinarian. “There’s more to being a veterinarian than liking puppies and kitties,” he said. But he studied the different things he found, and its purpose and relation to the other parts. McCauley plans to study zoology or marine biology. At the farrier stations, Mike Bagley, a horseshoe professional, showed how to heat and form a new shoe, and the importance of keeping good quality shoes on horses. 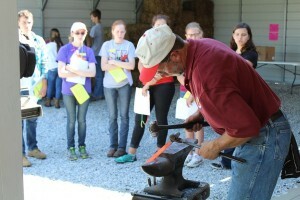 Randy Krug, a professional farrier, showed how to file and trim a horse’s hooves. He gave each student a piece of PVC pipe, which they straddled between their legs, as they would the leg of a horse. The PVC trimmed about the same as a horse’s hoof, Krug said, without the challenges of having each student work with a real horse. At one of the indoor sessions, Heather Neikirk, OSU ag and natural resources educator in Stark County, led a session on plants that are toxic to animals. She explained the different plant species that an animal “can and can’t eat” and pointed out the ones that can cause sickness and death. In addition to an education, each camper received a T-shirt, lunch and some items donated by sponsors. Red Star Veterinary Clinic opened at its current location about nine months ago, and is located at 5447 Lincoln Street East, East Canton, Ohio. To learn more about the camp, or the veterinary clinic, visit www.redstarvet.com, or call 330-871-8013.